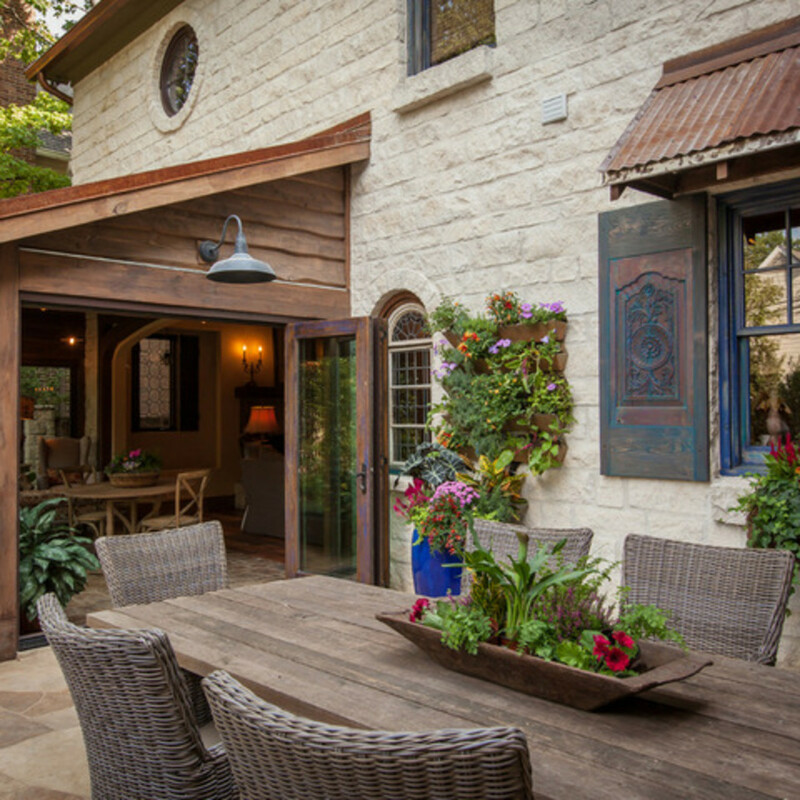 Craving a collected look her 1980s home didn't have, this Dallas homeowner hired general contractor Kevin Key to recreate a century-old look in her spacious University Park home. 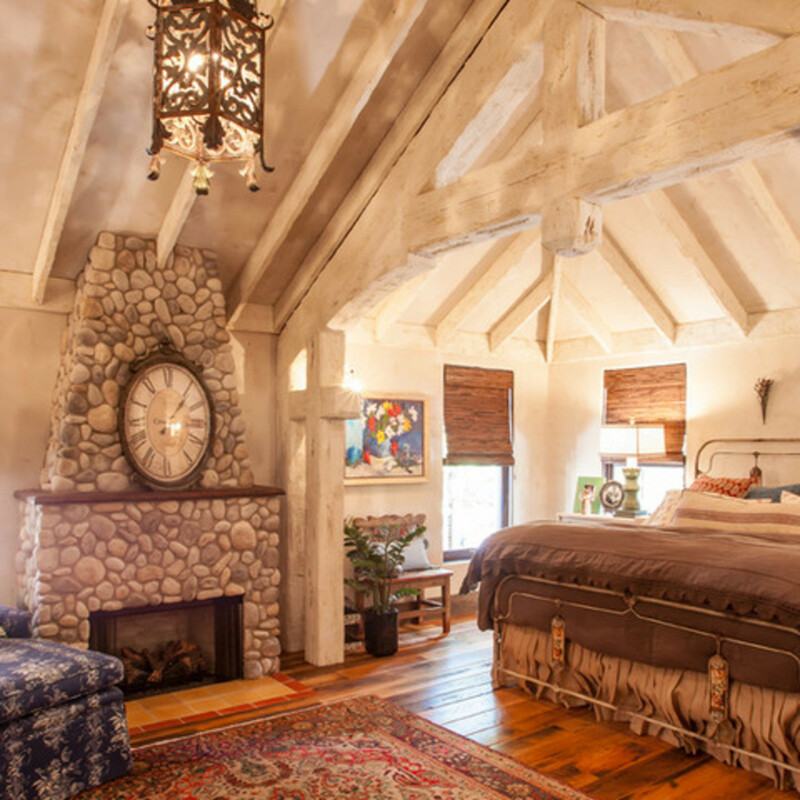 After hunting high and low for the perfect antique accents, salvaged materials, and unique color treatments, Key put it all together in a warm, luxe space. 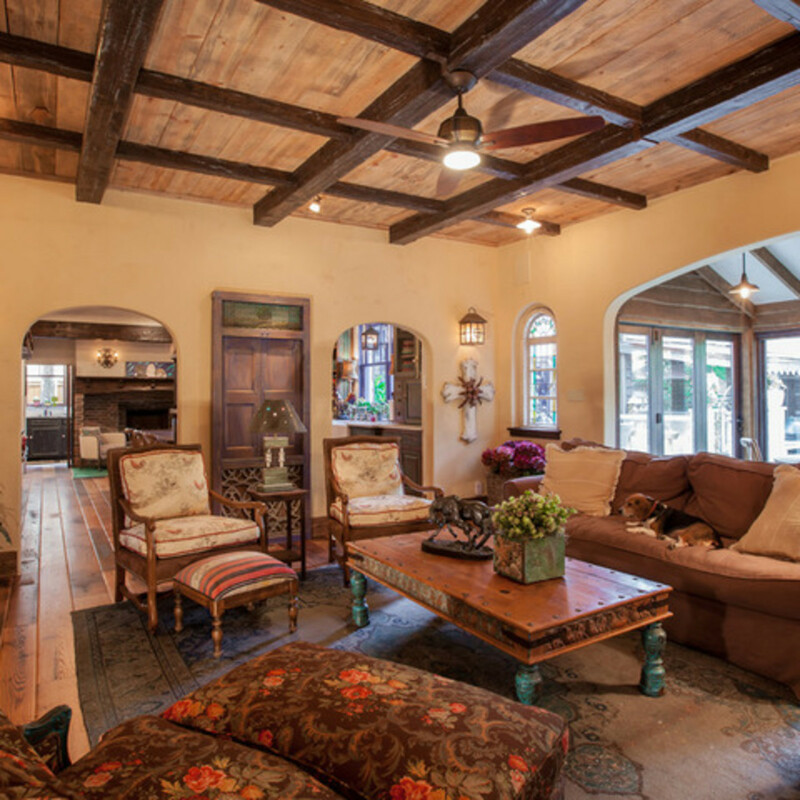 The house's interiors now look like they've been put together over decades. 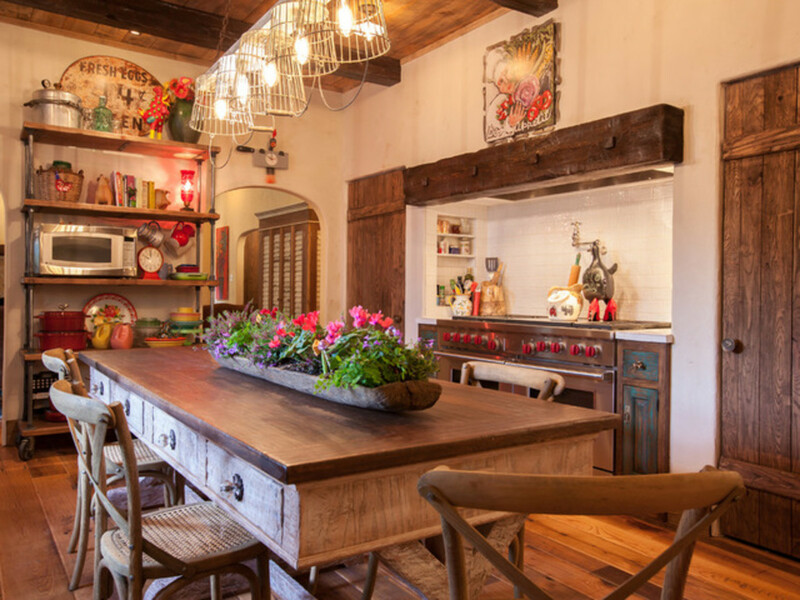 "It has that pieced-together farmhouse look," says Key. "But it's been pieced together with a purpose." 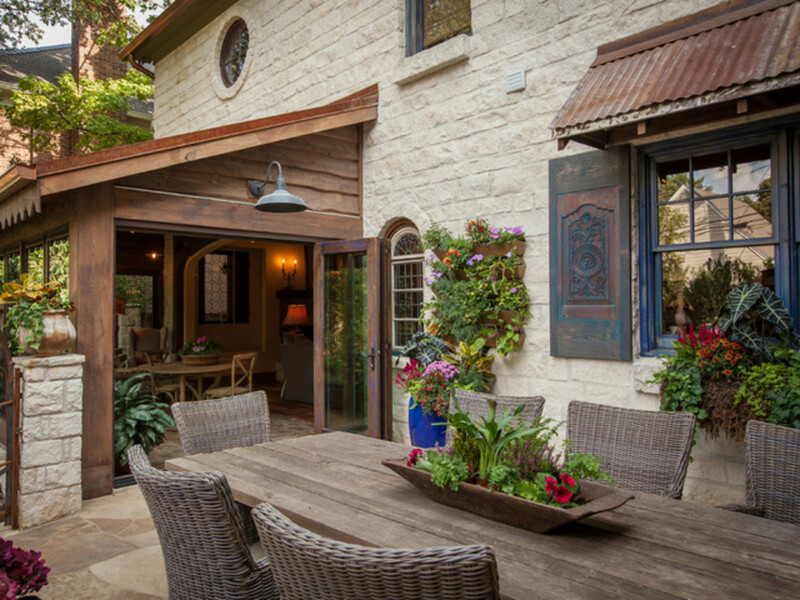 Key created a new history for the house through antique and aged elements — including the rusted cold-rolled steel awnings on the house and garage. Inside, he tackled the kitchen first. A hallway at the end of the kitchen had cut off the space from the rest of the house. The team eliminated the hallway (and an adjacent bathroom and utility space) to bring an existing fireplace, a seating area, and an extra 5 feet of space into the kitchen. Most of the oak cabinetry has the same scraped, hand-painted finish. The clients worked with the same painters on several other projects too, creating colorful custom finishes. Key designed the kitchen sink cabinet with a different tone. The clients wanted it to look like the entire cabinet had been casually rolled into place, so he put an indentation in the countertop to make it look like a separate piece. One wooden door hides the refrigerator; the other hides a freezer. 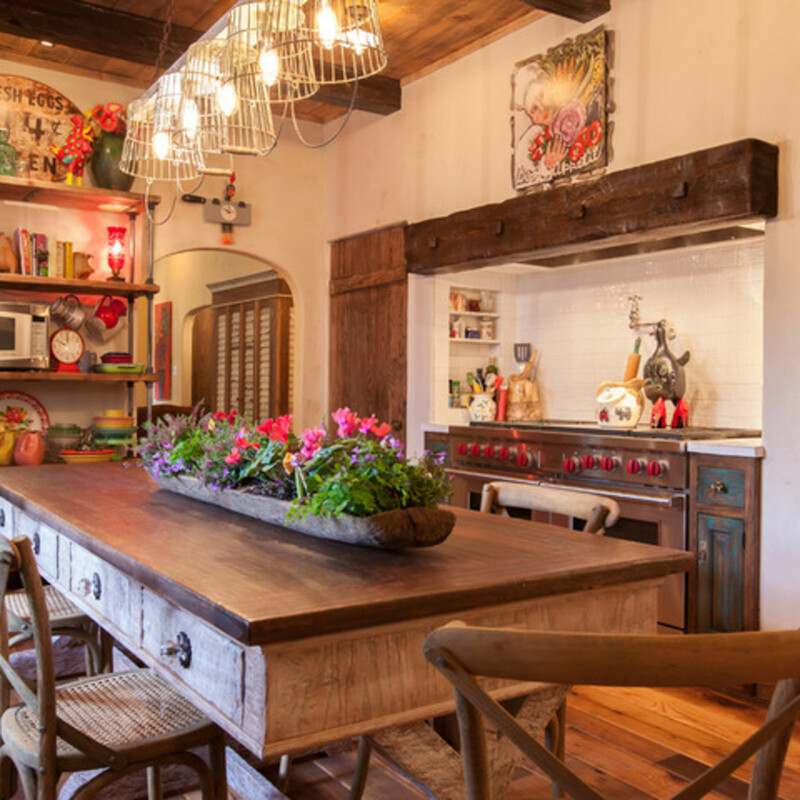 A custom table and wired antique chandelier reinforce the home's style. 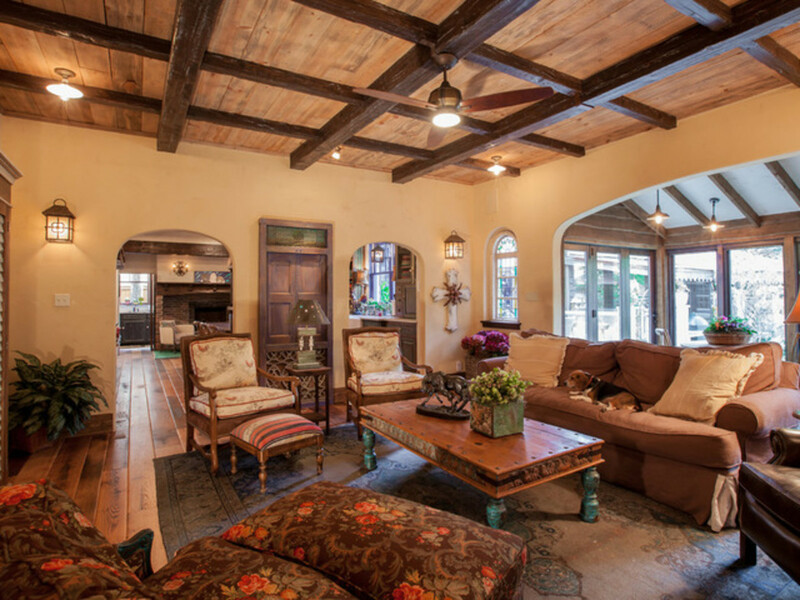 The original home had dark stained oak covering most of the floors, ceilings, and built-ins. The solid oak was beautiful but too dark for the homeowners' tastes. Key lightened up the home with plaster walls in warm creams and beiges; a blue pine ceiling in the living room draws the eyes up. 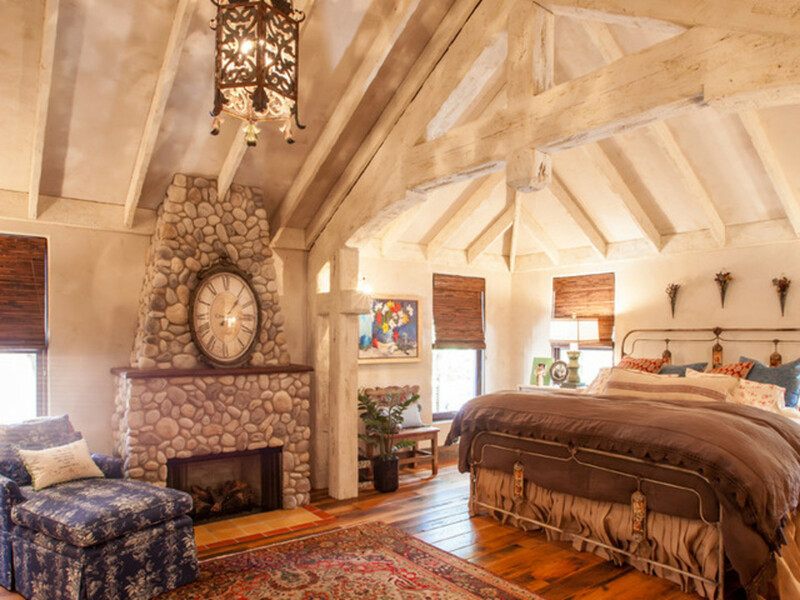 The pitched ceiling's beams are authentic and part of the roof's construction. Key had them distressed and a thickening agent applied after painting to intensify the rough, worn look. 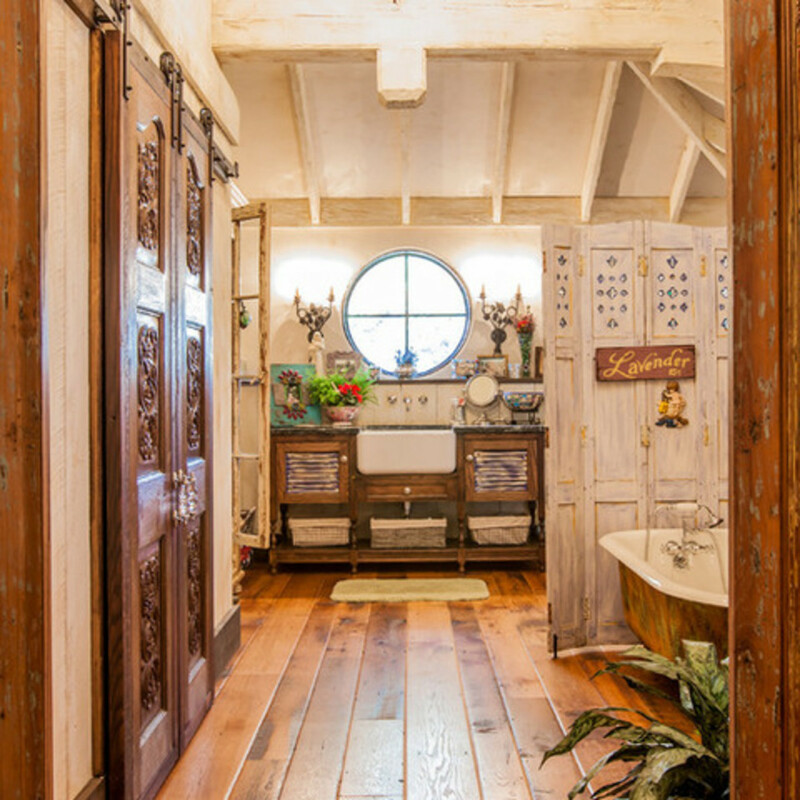 Salvaged flea market doors lead from the bedroom into the en suite bathroom. 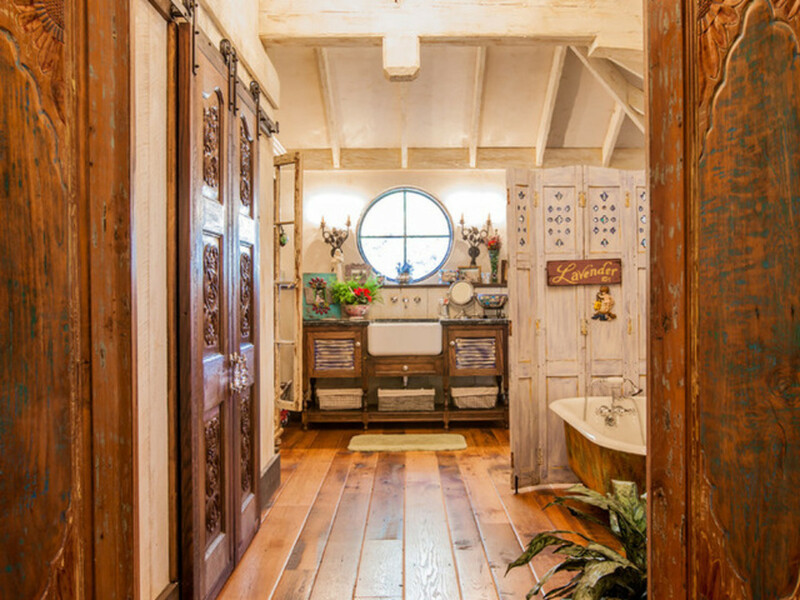 One of the homeowners found a refinished antique tub at a local reclaimed-fixture shop. A salvaged stained glass window next to the tub was distressed, framed, and mounted for one-of-a-kind art. 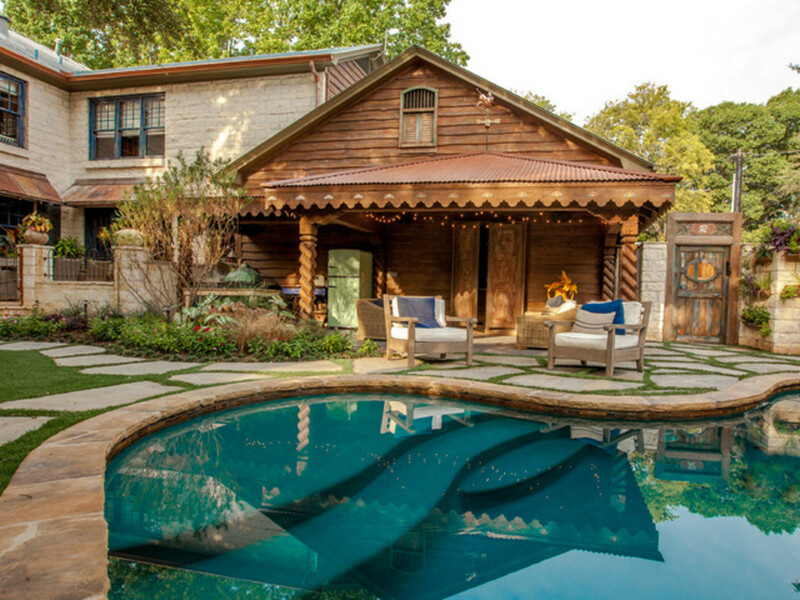 Out back, the designer turned a third of the home's attached garage into a poolside cabana. 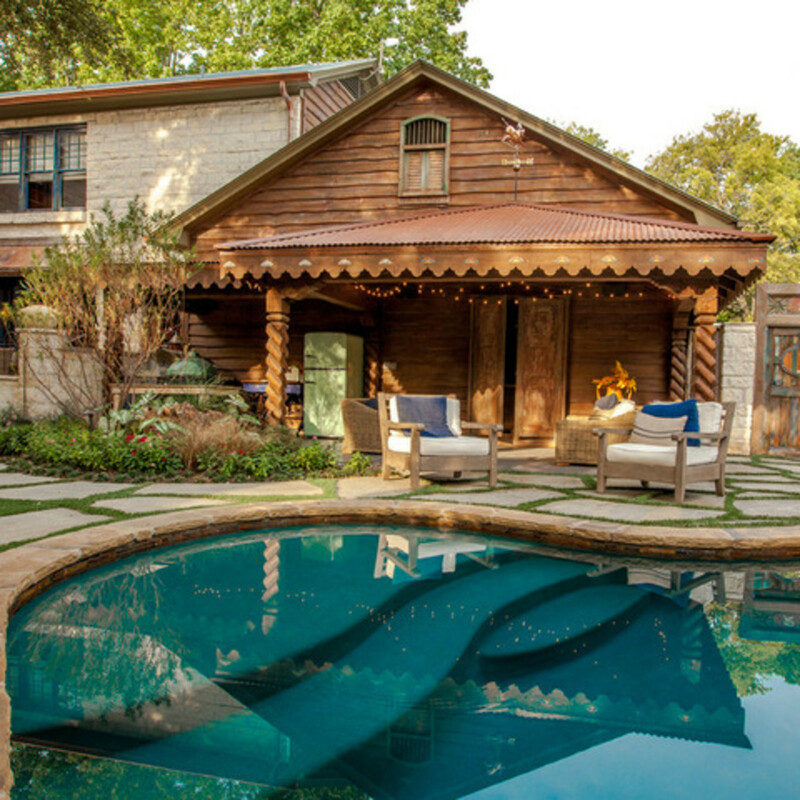 Wavy cedar siding gave the cabana the lived-in look the homeowner wanted. 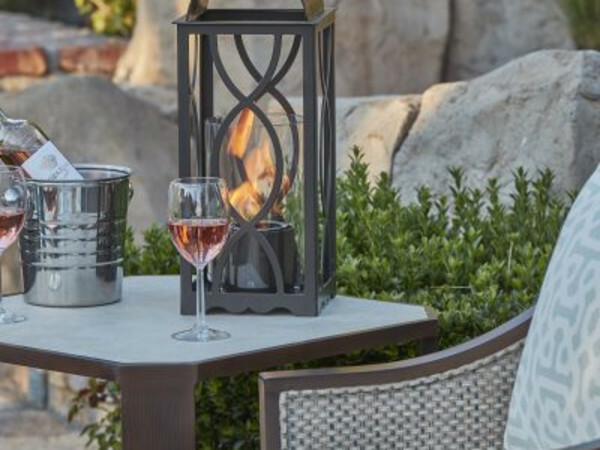 A new outdoor kitchen has sturdy concrete counters and a gas grill. Scraped cabinetry, a retro refrigerator, and a freestanding sink basin with vintage metal legs make the space feel warm and worn. In the front, a colorful and cozy porch swing instantly beckons for an afternoon nap. The entire landscape — including the custom fountain, made with a Louisiana sugar kettle (used in traditional sugar production) — revolves around the existing red oak tree. The tree also marks the start of a dry creek bed, which Key turned into a welcoming walkway from the street to the home's front door.